Avalanche Lake. Photo by Phil Brown. We sent files for the March/April Explorer to the print shop Monday, so I took the next day off to ski to Avalanche Pass and, given the dearth of snow this winter, was surprised at the quality of the skiing. We may get rain this week, so the conditions could change, but for what it’s worth, here’s my report on snow conditions on various parts of the trip. South Meadow Road. 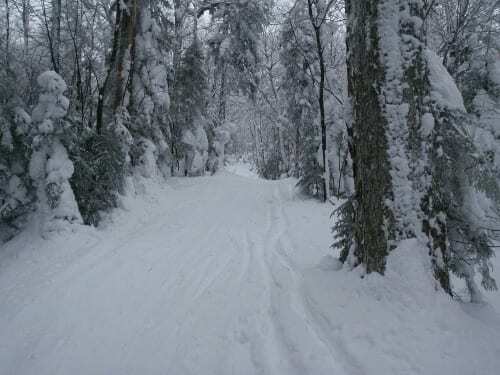 The ski from Adirondak Loj Road to the start of the Marcy Dam Truck Trail is sometimes icy, but on Tuesday, South Meadow Road was ideal for skiing: well-packed snow with a veneer of powder. Marcy Dam Truck Trail. Thin cover near the start and bare sections near the trail register and Klondike Brook. But most of the trail had good cover. 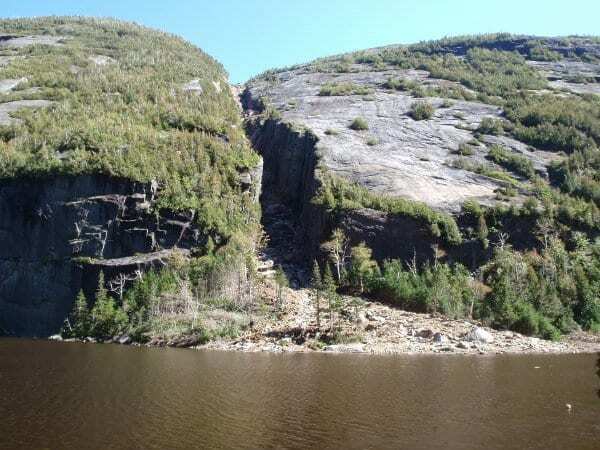 Marcy Dam to Avalanche Camps. Still lots of rocks poking through the snow, but they are easily avoided. Avalanche Pass Ski Trail. Not as much snow as we should have, but plenty enough for an enjoyable run. In three places, surveyor’s tape flags rocks or roots that might trip up a skier. Avalanche Pass to Avalanche Lake. Good cover. But on one of the descents, a signpost points left to a section of trail rerouted after Tropical Storm Irene. There is a big rock just as you make the turn. If you’re skiing, go straight on the old trail to avoid the rock. 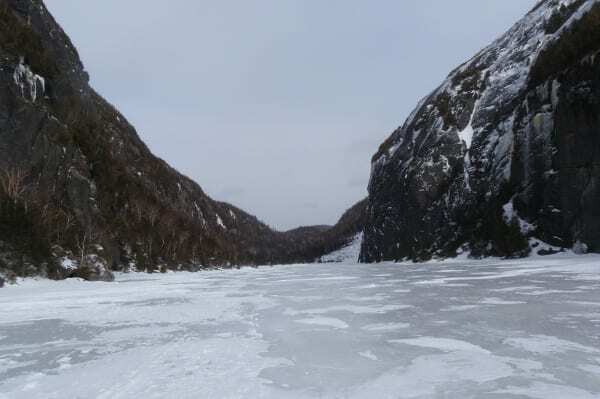 Avalanche Lake was frozen solid. Most of the snow had been blown off, exposing bluish ice. I skied to the base of the Trap Dike and was startled by its lack of snow. When I climbed the dike last winter, its waterfalls were largely buried in snow. Yesterday they were exposed, revealing long columns of ice. Too difficult for me to climb, I thought. 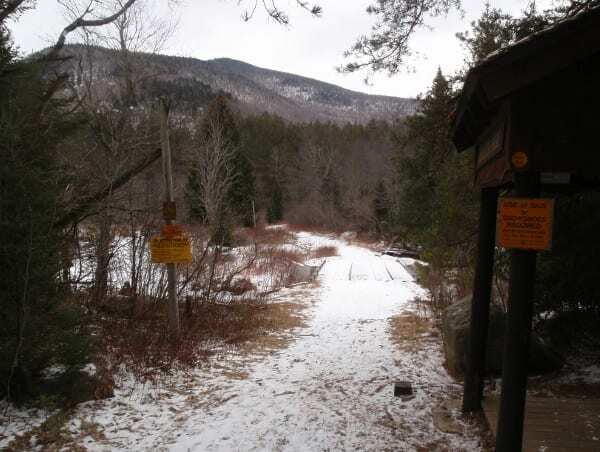 Snow cover on the Marcy Dam Truck Trail was thin at the start. Photo by Phil Brown. Did you really go through those two trees? Love it! 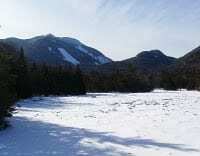 I climbed Tabletop last Friday and noting the lack of skiers on the trail, I was thinking of the video you posted last year of the ski back to Marcy dam from the Indian Falls area. Great stuff, Phil. Thanks!